In the four sessions I’ve worked the Montana Legislature one truth has been ever present: Some legislators don’t like Fish, Wildlife and Parks, and they detest sportsmen lobbyists. That’s why there’s traditionally been over 150 – 200 bills a session dealing with critters. It’s been an onslaught from folks looking to legislate hunting seasons because they were upset when the Commission restored the 90% rule on resident elk hunting in Central and Eastern Montana to eliminating the ability to sensibly manage large carnivores because the wolf wasn’t coming off the endangered species list fast enough. 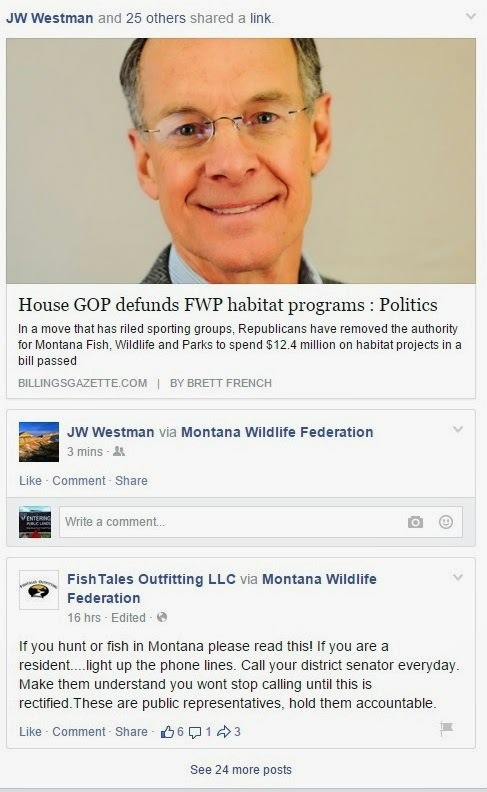 That’s changed this session, in large part to the sheer numbers of wildlife and access lobbyists in the building, and the overwhelming support FWP, hunting, fishing, public land and access have in Montana. In fact, every session, hundreds of Montanans show up to protest thoughtless, damaging bills being pushed to eliminate access and steal our public lands. There are some people who just don’t want the state buying more land and we want to think about it. And I share Representative Ellis’s angst, that I don’t really like the state to hang on to 12 million dollars for another two years, but I think this will give us the chance to work for the next two years on removing that statutory authority for the state to just continue to accumulate money to buy more land. That’s right, no more waterfowl production sites, conservation easements with access requirements. No more wildlife management areas to protect critical winter range and no more fishing access sites. Besides the obvious attack on access and the $6 billion outdoor economy, Hagstrom’s wrong. The state doesn’t accrue those funds. FWP does. Those are user fees paid by hunters and anglers who have mandated through their advocacy and legislation that the funds must be unavailable to the State for other uses. They’re not going to education, legislator healthcare or any other program. They’ll just sit there, not being used as statutorily mandated. Reduced the state special revenue appropriation for the Migratory Bird Program by $210,000 and restricted the use of the balance to prevent land acquisition. · Eliminated the Upland Game Bird program appropriation of $849,000. · Eliminated the Habitat Montana program appropriation of $10,668,000. · Eliminated the Big Horn Sheep Habitat program appropriation of $460,000. · Eliminated the Fishing Access Site program appropriation of $345,000. The amendments resulted in total reductions of $12,532,000 to FWP land acquisition, conservation and access programs. Fishing, apparently, is a great threat to private property rights. So is working on Bighorn Sheep Habitat. And more ducks. Some legislators are still upset over the former Governor Schweitzer’s policies of purchasing lands. We all get that. But let’s look at the reality of the last two years. Governor Bullock made it a priority to pull those purchases back and focus on managing what FWP currently owns and working with landowners on conservation easements. When you look at the Natural Resources sub-committee that worked on this issue, it’s not difficult to see why these programs were cut. Senator John Brenden has been antagonistic to sportsmen and FWP since buffalo roamed Daniels county. Senator Matt Rosendale hasn’t been a friend of access or sportsmen during his tenure either. Representative Nancy Balance doesn’t seem to want to understand that diversion of FWP funds for her pet projects like compensating landowners for crop damage and forcing FWP to spend $350K a year on shooting ranges would cost us $24 million a year in excise tax funds that help manage wildlife. Chairman Glimm, a sophomore representative from Kila seems like a nice enough guy, but, he was clearly demonstrating a lack of knowledge on how FWP budgeting works through his questions to the agency. Yet here he was, chairing the committee in charge of allocating authority to FWP to spend sportsmen’s money. And now we have Representative Hagstrom, who laid it out perfectly in his testimony on the 25th of March: The goal is to eliminate these wildly popular programs & shut down access and access funding. Representative Hagstrom having a bad day. Luckily, sportsmen & wildlife lobbyists have been paying attention and as HB 403 moves through the process. The bill passed the House and it’s been referred to Senate Finance and Claims. If the Montana GOP hopes to retain hunters and anglers in their core, they’re going to have to restore the spending authority so access isn’t cratered by the same people claiming that the State can manage 31 million acres of public land. Senators Brenden and Rosendale have been leading proponents of the transfer and sale of public land, which is a bit of a head-scratcher since it’s been Senator Brenden and Senator Rosendale who have been enthusiastic supporters of disallowing the state to gain any new lands in the past sessions (No Net Gain bills magically disappeared this session). Now, they’re voting to eliminate critical access programs on one hand, while telling everyone that public lands, which allow a heck of a lot more access than state lands, are evil and the cause of everyone’s distemper and flu along with economic hard times (regardless of the fact that the state has a whopping budget surplus). Meanwhile, the Montana Shooting Sports Association & Chairwoman Ballance continue to push the failed concept of mandatory spending on gun ranges. I suppose, in the end game for these guys, we’ll all have guns (except FWP) and we’ll all line up at shooting ranges flinging lead into targets instead of up in the hills, looking for elk. And we will argue about it until the authority to provide access is restored.